The extradition trial of Vijay Mallya, began today at a UK court here, with the embattled liquor baron rejecting the charges as "false, fabricated and baseless". 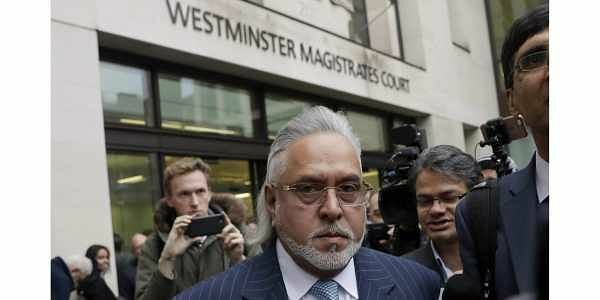 LONDON: The extradition trial of Vijay Mallya, wanted in India on charges of Rs 9,000 crores fraud and money laundering, today began at a UK court here, with the embattled liquor baron rejecting the charges as "false, fabricated and baseless". The trial, however, was briefly halted as the courtroom had to be evacuated due to a fire alarm. Mallya and others waited outside the Westminster magistrates court during the fire drill. The 61-year-old tycoon, out on a 650,000-pound bail bond following his arrest by Scotland Yard over fraud and money laundering charges, looked relaxed as he was greeted by a swarm of cameras and reporters when he entered Westminster Magistrates' Court for the opening day of his trial. "Please hear the proceedings," Mallya told reporters outside the courtroom. "These (allegations against me) are false, fabricated and baseless," Mallya said. Mallya, who has been out on bail since Scotland Yard executed an extradition warrant in April this year, will be in the dock for the duration of the trial Â– scheduled to end on December 14. A judgement in the case, being presided over by Judge Emma Louise Arbuthnot, is unlikely until early next year. His defence team is led by barrister Clare Montgomery, known as an expert in criminal and fraud law with the UKÂ’s Matrix Chambers. The Crown Prosecution Service (CPS) will be arguing on behalf of the Indian government, led by barrister Mark Summers. The CPS will need to demonstrate a prima facie case by producing evidence to show that the criminal charges against Mallya are justified and that he should be extradited to face the Indian courts. Prison conditions in India are expected to be at the forefront during the hearing, with the Indian government providing assurances of protection of Mallya's human rights. While on strict bail conditions, which include providing a bail bond worth 650,000 pounds, surrender of his passport and a ban on possessing any travel documents, the former Rajya Sabha member has been based at his Hertfordshire estate Ladywalk in the village of Tewin, around 30 miles from London. The CPS, acting on behalf of the Indian authorities, had presented "supplemental" charges of money laundering to previous charges of fraud against the businessman at an earlier hearing in October. The judge had agreed to effectively re-open a fresh case so that all charges can be heard concurrently in court. If the judge rules in favour of extradition at the end of the trial, the UK home secretary must order MallyaÂ’s extradition within two months. However, the case can go through a series of appeals in higher UK courts before arriving at a conclusion. Judge Arbuthnot and her colleague, Rebecca Crane, at Westminster MagistratesÂ’ Court have recently rejected two other long-pending extradition requests from India, that of UK-based alleged bookie Sanjeev Kumar Chawla on October 16 and a British Indian couple, Jatinder and Asha Rani Angurala, on October 12, relating to bank fraud. Chawla, the key accused in the cricket match-fixing scandal involving former South African captain Hanse Cronje in 2000, was discharged on human rights grounds over severe conditions in DelhiÂ’s Tihar Jail where he was to be held on being extradited. The Anguralas were discharged on grounds of over 25 years having passed.